Battered, fried okra of the sort they serve at meat-and-three restaurants in the South is a magnificent thing, and I ate a ton of it during my years in Alabama. 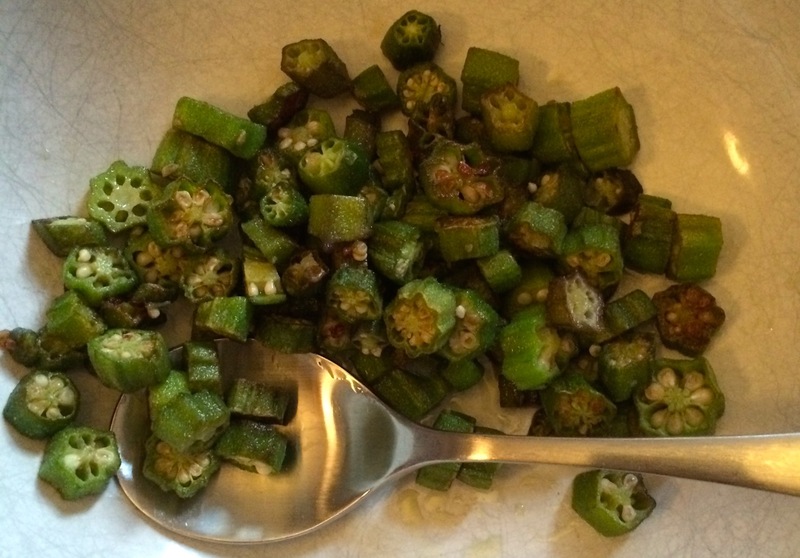 Bhindi masala, the spicy okra dish common in Indian restaurants, is pretty great, too. Then there’s gumbo, and lots of African and Caribbean and Asian and Mediterranean okra dishes that I’d really like to try someday. 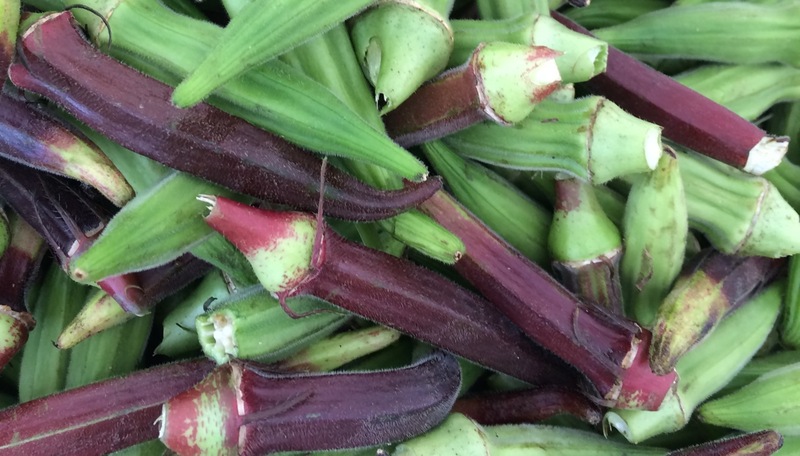 But when okra is fresh off the field, as it is these days at the farmer’s markets around me (the photo above was taken at the Thursday market in front of Columbia University), going to the effort of battering or spicing or stewing seems almost criminal. The okra is so flavorful on its own that cooking it with just a little bit of oil and salt is the best possible thing you can do with it. 1. Buy some okra, of the fresh, unblemished sort that is customary at farmer’s markets and can occasionally be found at supermarkets. Small pods are usually better than big ones, but the key differentiator is whether they feel slightly springy to the touch or kinda hard. You want springy. How much? Maybe 4-5 pods a person, although I’m perfectly capable of consuming 20 pods all by myself. Okra tends to be pretty expensive as veggies go — $6 a pound seems to be the standard price at the farmer’s markets I frequent; the very pretty ones above, though, went for $8. 2. Chop the okra into rounds of about half an inch. I discard the end and the tip of each pod, which is probably a waste. They’re perfectly edible, I’m just worried that they won’t cook well with the rest. Warning: this will get a little sticky. You may need to wash your knife midway, and you’ll definitely want to scrub the cutting board when you’re done. 3. Put a skillet (preferably cast-iron) on the stove and turn the heat up to medium. Pour in some olive oil and, if you like butter (I do! ), throw in some of that too — although it’s really fine with just oil. Maybe a tablespoon of each if you’re cooking 20-25 pods. 4. 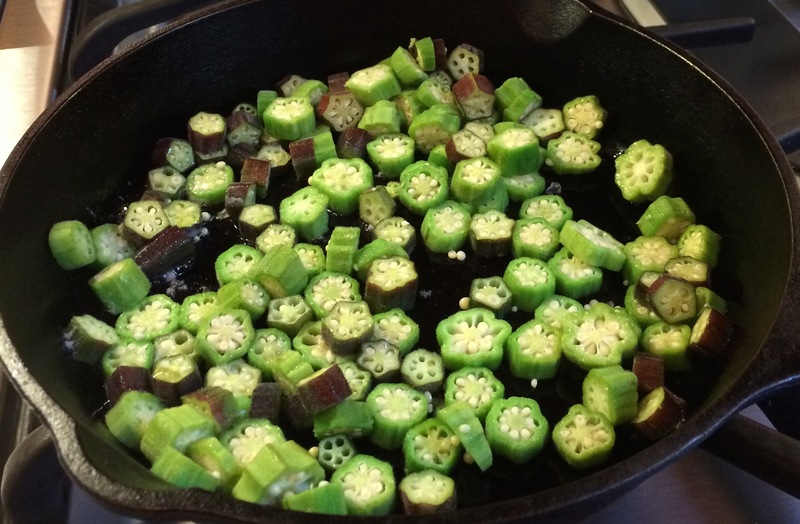 Throw the okra into the skillet. The pieces will stick to each other at first, so you’ll need to spend some time with a spatula separating them and making sure they get coated with oil/butter. I add a pinch or two of salt at this point, but don’t put in too much. You can always add more when it’s done. 5. Cook, flipping the okra rounds over with a spatula pretty frequently, until most of them are brown on both sides. I used to go to great lengths make sure every single round got evenly browned, sometimes even picking them up one-by-one with tongs. But that’s really unnecessary.